Jimmie B. Wilson earned his wings on Tuesday, December 4, 2018. He was surrounded by his loving family at the Seneca House, Tiffin, Ohio. Jim was born on January 22, 1928 in Talcott, West Virginia to Harley and Nannie Mae (Garten) Wilson. He is survived by wife, Marilyn of Tiffin, his daughter, Susan Marks of Dallas, TX, son, David (Roberta) Wilson of Columbus, daughter-in-law, Chris Wilson of Tiffin; grandchildren, Stephanie (Jeff) Simpson of Saratoga Springs, NY; Shawn (Hannah) Wilson of Tiffin, Sara (Jason) Lather of Whitehouse, Blair Wilson of Dallas, TX, Maggie Wilson of Columbus and Brady Wilson of Columbus; step grandchildren, Trae (Kayla) Marks of Saginaw, TX and Lacey Marks of Denton, TX; his very special aunt, Mary Coulter of Plano, TX. Mary, who is 104, maintained a very special bond with Jim for his entire life; stepchildren, David (Judy) Herrmann of Marysville, OH, Julie (Jim) Arnold of Reynoldsburg and Dr. Tom (Lisa) Hermann of Westerville; and several nieces, nephews, grandchildren, and great-grandchildren. He was preceded in death by first wife, Marjorie (Moore) Wilson, who he married on September 4, 1949 in Tiffin, OH. Marjorie passed on September 13, 1998. He was also proceeded in death by his parents; son, Robert J. Wilson; son-in-law, Dean Marks; grandson, Casey Wilson; and siblings, Harold Wilson, Virgil Wilson, Anna Belle Taylor and Dorothy Wilson. Jim’s father relocated to McCutchensville, OH where his grandmother and aunt could assist with the raising of his five children. Jim joined the Navy in 1945, and was stationed at Guantanamo Bay, Cuba. After his service, Jim retuned to Tiffin and was a graduate of Tiffin Columbian High School class of 1947. While attending classes at Tiffin University, he began his career in TV repair, and later came into contact with Cleveland businessman Dominic Visconsi, who encouraged him to enter into real estate. 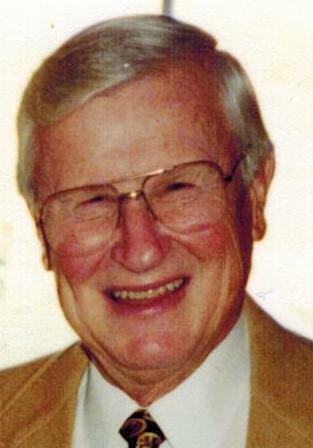 He launched Jim Wilson Reality in 1958, and worked as a residential and commercial developer, broker, and salesman until his retirement in 2015. Jim was a lifelong member of Shriners, AmVets Post 48, Moose Lodge #846, Tiffin Eagles #402, American Legion #169, Tiffin Chamber of Commerce, Greatlakes Seniors Golf Association and a 50+-year member of Mohawk Country Club. Jim and Marjorie were both very avid golfers, both achieving a hole-in-one at Mohawk. He could often be found golfing four to five days a week. He had a traveling group of friends, that every summer packed up an RV and visited many different courses over the years. He also enjoyed playing poker, participating in a monthly game for over 40 years. Jim sold the land that became the Seneca County Airport to Dwight Gnepper, who later donated the property to Seneca County to build the runway. Jim was an original member of the Seneca County Airport Advisory Committee, assisting with development and opening the Airport in 1968. This was the start of a lifelong bond and friendship with both Dwight and Jeannie. He attended many airshows with Dwight throughout the years. Jim also had his pilots license and enjoyed taking an occasional flight around Ohio. Jim also enjoyed reading, owning several books about WWII and U.S. History. He visited many historical sites, including the USS Arizona Memorial, and was chosen to participate in the Veteran’s Honor Flight to Washington, DC. Jim found the second love of his life, Marilyn Herrmann, marrying on November 11, 1999. The couple enjoyed traveling with the Allen Eiry Senior Center and spending time with Marilyn’s family. Jim was fortunate to have had so many close and long-term friendships, too many to list. We were fortunate to have him for almost 91 years. His faith was very important to him, and he is now at peace. We would like to extend a very special thanks to Heartland Hospice, and the staff at Seneca House, who cared for Marilyn and Jim for two years. He did not have a favorite nurse or aid; he loved you all. Also, a special thanks to his special neighbors, the Durbins and Aleys for always checking in on them over the years. A Funeral Service will be at 11:00 A.M. on Friday, December 28, 2018 at Trinity United Church of Christ with Rev. Cheri Holdridge officiating. Burial will follow in Fairmont Cemetery. Friends may visit with the family from 10:00 A.M. until the time of the Service on Friday, December 28, 2018 at the Church.